The quality of Yu Darvish’s stuff is glaringly obvious. His fastball sits between 91-95 MPH and has serious run, while he throws a pair of breaking balls that dive differently and works in an 89 MPH cutter with late action. And, he’s got a wide enough variety of options to give hitters a lot of different looks. As you can see, there are no distinct clumps there. He’s thrown curveballs at 66 MPH, curveballs at 80 MPH, and pretty much everything in between. His slider has been between 80 and 86, and then his three fastballs give him the ability to go anywhere between 88 and 95. This is the repertoire of a guy who should miss a lot of bats. And yet, after three starts, Darvish just isn’t fooling anyone. 333 pitches into his big league career, and opposing batters have made contact on 81.6% of the pitches he’s thrown. Major League average for a starting pitcher in 2012 is 81.7%. For comparison, the other pitchers with contact rates between 81.0-81.9% include Doug Fister, Felix Doubront, Jake Arrieta, R.A. Dickey, Ervin Santana, Mark Buehrle, Jamie Moyer, Jaime Garcia, Ryan Vogelsong, Jonathan Sanchez, Ian Kennedy, and Freddy Garcia. There’s some good pitchers in there, so it’s not like being associated with Kennedy and Garcia is a disaster. Besides, it’s just three starts, but I’d imagine that having the same rate contact allowed as Jamie Moyer was not exactly what the Rangers had in mind when they paid over $100 million to acquire Darvish this off-season. So, what’s the deal? If Darvish’s stuff is as good as it looks, then why isn’t he getting batters to swing and miss more often? The main reason appears to be directly related to the first pitch of each at-bat. Darvish has thrown a first pitch strike to just 48% of the batters he’s faced – league average is 59%. Most pitchers, especially the good ones, are able to get ahead in the count with regularity and expand the zone from there. Darvish has had to pitch from behind in the count to 46 of the 88 batters he’s faced this year, and opposing batters are just choosing to lay off his hard-to-hit breaking balls and wait for a fastball that they know is coming eventually. And, thanks to Darvish’s struggles to throw his fastball for strikes, they haven’t even had to chase those fastballs in many cases. Most of Darvish’s command problems have against left-handed batters – he’s walked 17.2% of the ones he’s faced – and he’s simply not been able to throw his fastball for strikes against lefties. As you can see, he’s pitched almost exclusively away against left-handed batters, but he hasn’t been able to throw the fastball on the outer half of the plate with regularity. He hasn’t even been missing on the borders – there’s a large section of pitches that have been way outside, or so far and up and away that the hitter didn’t even need to consider swinging. Add in that that he’s only really working one side of the plate against LHBs, and opposing hitters have been able to look for a pitch in a certain spot, and if it’s not there, lay off. And lay off they have. Batters have only swung at 40.8% of the pitches Darvish has thrown this year, and only 22.5% of the pitches that have been outside of the Pitch F/x defined strike zone. By living outside the zone and constantly pitching from behind in the count, Darvish has essentially neutralized his swing-and-miss pitches. Until he starts getting ahead in the count more regularly, opposing batters will simply continue to sit on the fastballs away, and make him show that he can throw those for strikes on a consistent basis. On one hand, it’s only three starts, and his numbers aren’t all that different from what David Price has posted early on, and no one believes that Price is going to struggle all year long. The difference, though, is that Price has shown that he can throw strikes against American hitters, while Darvish has not. Even in spring training, this is how Darvish pitched – fastballs up and away, constantly falling behind hitters, and issuing way too many walks. In Japan, of course, this wasn’t Darvish at all. He walked just 1.4 batters per nine innings in 2011, and his ability to pound the zone while still missing bats is part of what made him so good. 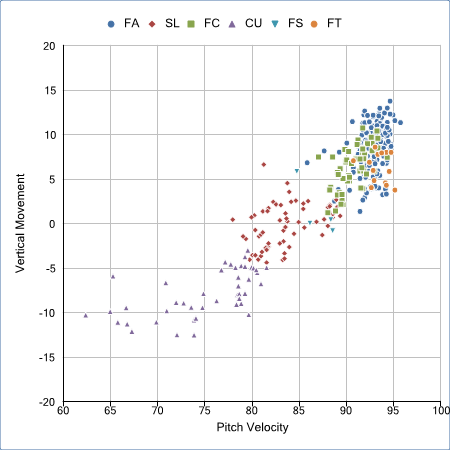 However, the quality of competition is clearly different in the Major Leagues, and to date, Darvish hasn’t shown the same ability to consistently throw his fastball for strikes. Until he does, his stuff is going to have to bail him out of jams rather than allow him to put hitters away. There’s no question that he has the pitches to miss bats, but part of generating swinging strikes is getting hitters to chase pitches out of the zone. They won’t do that when the count is routinely 1-0 or 2-1, so Darvish is just going to have to figure out how to throw his fastball for strikes more often. It’s far too early to be calling him a bust or to believe that this is the best he has to offer, but it seems that he might not have been as polished as his numbers from Japan led people to believe. He still has the chance to develop into a frontline starting pitcher, but right now, he looks a lot more like a prospect who isn’t quite ready for the show. We hoped you liked reading Yu Darvish’s Command Problem by Dave Cameron! I don’t understand why it’s so much harder for him to command his pitches in America as opposed to Japan. Is the strike zone that much different? Do hitters chase more pitches there? Is he pitching less aggressively? Also the size and shape of the strike zone differs between the leagues. What kind of baseball do they use for WBC? Why don’t standardize the size of baseball across the world?? I thought I read an article here on FG awhile back that said Darvish was working out with an MLB ball for the last year or so in Japan. They use the MLB ball for the WBC. Japan also standardized theirs during Darvish’s last season there to be more similar to the MLB ball. I think he is just going through a phase of adapting to better hitters and a different strike zone. M Wieters homered to right. Wait until he sees the Padres in interleague. If you look at Matsuzaka’s control in Japan, it was also much better compared to when he crossed over (His walk rate more than doubled). Based only on that, it’s not surprising that that Darvish is also walking batters at a drastically higher rate early on. Bigger strikezone over there? Freer swingers? I couldn’t tell you. What about other Japanese starters? Ishii’s walk rate also went up, though not as drastically. I can’t find Irabu’s Japanese walk rate, but his was fairly high in the MLB. On the other hand, Kuroda’s walk rate stayed pretty constant when he joined the Dodgers. Going back even further, Hideo Nomo cut his walk rate nearly in half when he crossed over in 1995. Perhaps the lesson is that walk rates in Japan simply don’t translate to walk rates in MLB with any sort of precision. 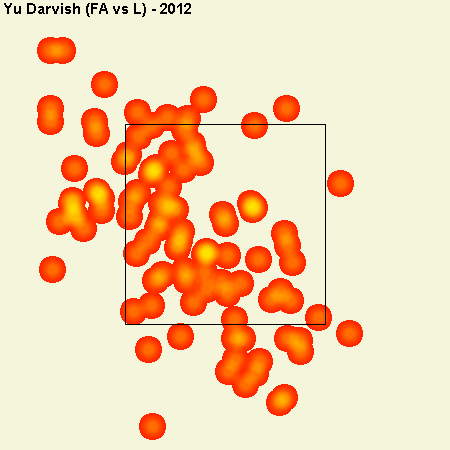 There is certainly an asymmetry between batters’ and Darvish’s familiarity with the MLB strikezone. That is, they know precisely where the strikezone is and he’s still learning it. Kuroda’s walks will likely skyrocket this year now that he’s in the AL or he’ll give up a ton of hits. Darvish = Matsuzaka 2.0. He’ll have some nice games but overall he won’t earn anything close to what he was paid. We heard time and again that Darvish was not the second coming of Daisuke. If we remember back to what Daisuke was when he came over it’s apparent that stuff wise they are quite comparable. Velocity and secondary pitches are quite similiar. I think a problem both of them face is trying to be to precise when throwing pitches.